I spent Thursday, Friday, and Saturday in Sacramento plotting how my colleague and I could get an entry to the California International Marathon Relay. CIM was one of the handful of events that I offered to work this year. Being that it was after NYCM and I knew that 97.6% of running bloggers – yes, a very calculated and accurate number – would be running the race it seemed like a fun one where training could take a back seat. As the weekend neared I was excited to spectate and cheer on the superb field of elite athletes, and all of my friends running alongside of them. And to drink some good California wine and beer, too. All week I crammed in double days so that I could be a free spirit in Sacramento. Monday was a 4k swim & 6 mi run. Tuesday was a 30mi bike & weights. Wednesday was a 4k swim & 10mi run. Thursday was an hour of bike intervals and weights before the flight. But as soon as we landed Marathon Fever started taking over, and the forecast of pouring rain, flooding flatlands, and 30 MPH winds only made the thought of running sound more romantic. To quench my marathon thirst I set out early Friday morning to run long, 12.4 miles before the expo. It was pouring like Seattle rarely sees (in Sacramento nonetheless), whole sheets of water were falling from the sky. 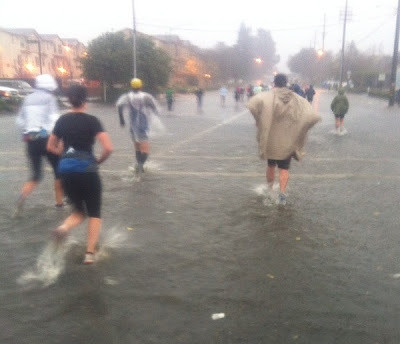 By 2 miles in I stopped avoiding puddles because there was really no point. I was so soaked that I couldn’t have possibly gotten any wetter. But it was another step in the right direction and a good reminder of how much I can really love running. The expo was fun as well. On Friday I got to see friends from Seattle who were in town to run and wish them luck before the big day, and it was the most organized and civilized expo you could imagine. Runners were there to run rather than shop! Imagine that! But everyone was pacing the expo in their Boston, Ironman, and Western States 100 gear, and I really really wanted in on the fun. Casey – my expo partner in crime – made jokes about creating a relay team with the two of us, and the moment he said it running was GAME ON. Saturday was spent hydrating the masses, meeting up with blogger friends from near and far, and gaining our entry. Then Sunday it was time to run! I took the last three legs, mostly because at that point the .2 mile difference seemed to matter, with an injured knee Casey couldn’t run more than one leg, and with the weather being exactly according to the forecast it would be miserable to run legs that were separated plus the fact that no transportation was available from one middle point to another. I headed off on the bus in what felt like the middle of the night and started to question my own sanity. I closed my eyes for a few minutes and before I knew it we were at the exchange point. More with the torrential downpours. More with the wind. It was some serious weather. But from the moment I actually committed to the race, similar to how I felt at Boise 70.3, it was okay. Getting started was sort of an out of body experience because I had to admit it was happening, but as soon as I put one foot in front of the other, after Casey gave me our chip, the weather could not have mattered less. I ran and ran and tried to approach the race how I did in Boston. Do my best for THAT DAY and not in comparison to anything else. I high fived kids, thanked volunteers, and mostly thought about how crazy they were all for standing out in that weather…they didn’t even have a marathon to run yet they were still out there braving it for us. Photo taken by hmgiraffy and used by bloggers everywhere. True photo from the CIM course. A few times I wondered when the fun would run out. After a long spring/summer/fall of crappy running, the highest mileage week I’d had in weeks (even WITHOUT the marathon) and tapering for NYC into 2 weeks of binge eating and drinking, I knew that ish would hit the fan at some point. I anticipated each exchange knowing that I could quit if I needed to, but at each one I proudly ran past the volunteers ushering me into the exchange chute, “Nope! I’m running the next one too! Thank you! !” It never hit the fan, not at all, and each mile got better and better. Except for my outfit. My outfit most certainly did NOT get better and better with every mile. Short running shorts combined with a 2 sizes too big top paired with pouring rain left me wearing a blue shirtdress by the end of the race. The poor spectators probably thought I wasn’t wearing any shorts! But at least I didn’t run a whole marathon in a plastic bag like some people (true story, many people finished the whole marathon, even fast people, wearing plastic garbage bags as ponchos). I’ll be sure to share pictures if I ever find them. When all was said and done we finished our marathon in 3:35:57, in 3rd of 52 for our division, and 70th of 897 overall. Pretty good, dare I say. Pretty good. It almost makes me want to run a real marathon, all on my own, soon. No matter that now I’m sick.